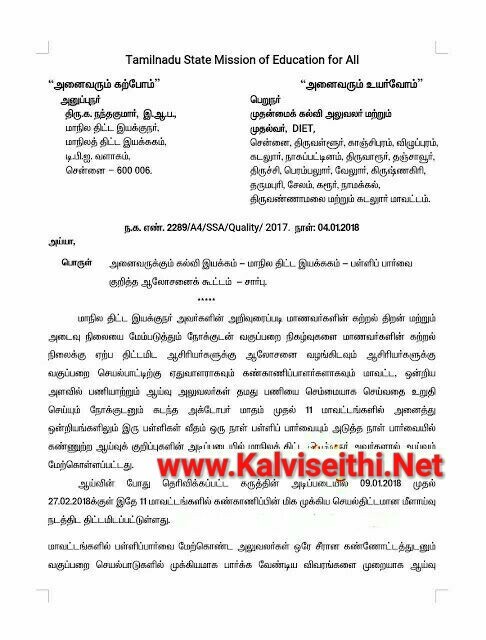 STATE TEAM VISIT - 9.01.2018 முதல் 27.02.2017 வரை மீண்டும் பள்ளிகளை ஆய்வு நடத்த SPD உத்தரவு. Good evening to everybody.I am Mr.A.Ulaganathan working as a secondary grade teacher in PUMS ANNAI INDIRA NAGAR, MUDICHUR in CHITLAPAKKAM BLOCK.Now i have filed the contepmt petition No.2296/2017against our Education secretary Mr.Pradeep yadav IAS ,Elementary director Mr.Karmegem(ex)and Mr.Dayalan DEEo kancheepuram.This civil contempt case soonly hearing at honourable Madras highcourt. Sir tell me the reason for filing ? On which topic ? Is that regarding team visit??? ?